Each quarter the executive leadership team of Integrated Community Development International (ICDI) meets for strategic planning and evaluation. The spring 2009 meetings wrapped up this past Friday, March 20. 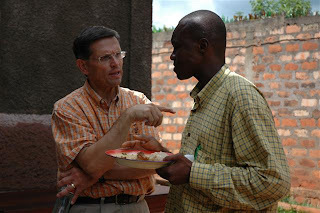 ICDI exists to empower central Africans to give hope to the poor in Jesus’ name. ICDI accomplishes this by means of sustainable community development best practices in seven core competency areas: potable water, sanitation, micro-enterprise & finance, orphan care, agriculture, public radio, and AIDS education. In response to the growth and strategic staffing needs of ICDI some staffing changes and several new additions are being implemented this year. ICDI continues to experience significant growth in program services, partnership and donor support, along with increasing capacity to employ central Africans to bonifide employment and community development roles. After serving ten months in a senior management role, Dan Thornton is leaving ICDI to pursue other ministry interests. Dan, formerly a senior pastor in Alaska, has helped ICDI understand better the importance of strategic planning and has assisted greatly in streamlining the complex logistics of ICDI equipment and supply chain purchasing and transatlantic transit. Bob Belohlavek (at left in photo), has been advanced to ICDI Chief Operations Officer. Previously overseeing only ICDI’s Africa operations, Bob will now add to his responsibilities additional leadership engagement with ICDI’s vision and values within the US based operations. This will further enhance the integration of ICDI’s sustainable community development principles in all aspects of ICDI’s operations. Personnel will be sought for three key roles within ICDI: Director of Water Programs, Logistics & Special Projects Coordinator, and a Short-Term Team Coordinator. These job offers will give the right candidate an opportunity to work in a fast-paced team setting as a part of an up and coming community development organization impacting thousands of central Africans with humanitarian and spiritual relief and development. Stay tuned for more details or contact info@icdinternational.org.